One of the biggest trends this spring is an off-the-shoulder top. I love this trend so much because it is an unexpected and classy way to show off a little skin. This lace Cupcakes and Cashmere top is perfect for the spring and summer months. It is so comfortable and goes with pretty much anything. You could pair this with jeans like I did today for a more casual look or with a basic black pencil skirt to dress it up a bit. I love a top that is versatile enough to get more than one look with it. In NYC closet space is tight so I always look for clothes that can be worn multiple ways to get the most use out of them! To add a pop of color I wore my Star Mela clutch that I bought last spring. 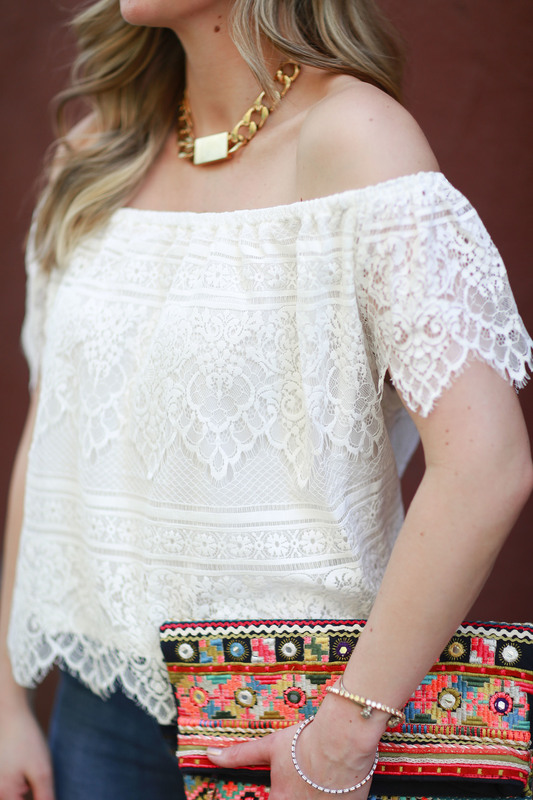 This clutch is great because it instantly brightens up my outfit and adds a little bit of a bohemian vibe. The perfect spring look to kick off the week!